* Lovely apartment ideal for couple - or families with children - near San Marco and San Lorenzo. Very quiet and bright. Recently restorated and tastefully decorated. It overlooks a sunny courtyard, a very relaxing place to have breakfast or tea. * The flat is on the ground floor (no stairs), and consists of: living room with dining corner (table for 4 people) and comfortable sofa bed for two persons (bed: 200 cm x 80 cm), kitchen corner with fridge/freezer, gas stove with 4 burners, microwave, bedroom with double bed (150 x 200 cm), 2 wardrobes, desk and chairs, spacious bathroom with separated WC and bidet, shower in a stall. * Wi-fi Internet, TV sat, air cond. Up to 4 people. A full selection of Lonely Planet travel guides are available in the flat. * To access the apartment and its courtyard, the owner's building and private space must be crossed. * In the very street where the flat is located - anciently called via Mozza - Michelangelo had his own studio. Here he worked and lived, and after his death here were found the 4 Prigioni (today at the Academia together with the David) and the Victory (today in Palazzo Vecchio). This part of town is known as the 'Medici quarter'. * From here the glorious Florentine family started its adventure for the conquest of power. Here they built their own Palace, Palazzo Medici, away from the old aristocracy’s dwellings. Here Cosimo il Vecchio erected the San Marco monastery (today museum) where he kept a cell for himself, painted by Beato Angelico, which can still be visited today. And here the Medici didn’t limit their ambitions to a family chapel, like everybody else: they had to have their own parish church, the basilica of San Lorenzo, one of the largest churches in the city, designed by Brunelleschi, embellished by Donatello, and also the burial place of seven generations of princes and princess (the Medici Chapels). * All this can be reached within 5 minute walk from the Michelangelo’ studio apartment: a secret retreat to live the art experience and allure of a city unrivaled for its art, beauty and culture. We bought this house because we thought it was the perfect place to be: in the heart of Florence, but away from the main crowds. The owner is from Florence: she and her family spent many years abroad and recently came back. They speak various languages. Since they live practically next door, they are willing to help their guests out and - upon requests - they are available for (free) Museum ticket reservation, restaurant reservation, advice on what's going on in town, cooking classes, baby sitting service etc. Host Dani is wonderful and her family are gracious and helpful. Location of cottage accessible, tranquil and well appointed. Dani and her family are so generous and helpful with information and suggestions. Close to train station and all major sights. Highly recommend !! I was a pleasure to meet you and give you few hints to make your visit memorable Anita, you are a such a gracious guest. Come back any time! 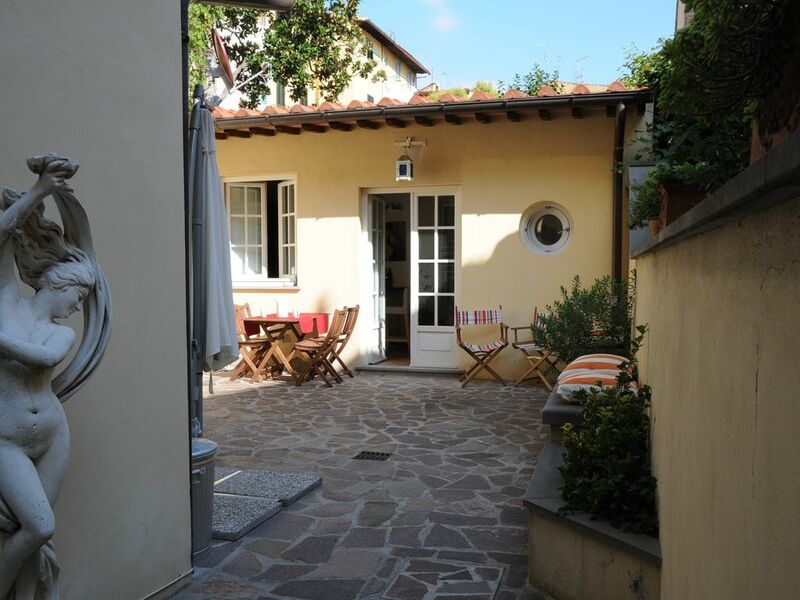 This is a wonderful quiet romantic cottage in Florence. Dani was a great host and made sure our stay was comfortable. The cottage is separate from the main house with a courtyard. You have to go through the main house to get to the cottage but this is not a problem. The cottage was well equipped with all the amenities one needs. It is a good location, ~ 15 minute walk from the train station and close to the Central Market. I highly recommend the cottage for your stay in Florence. We were recently in Florence for a three night stay and the little Michelangelo cottage served our needs nicely when we were there. While we were not able to check in right away (cleaning up from previous guests), we were able to leave our bags and head out to get some lunch and explore the immediate area. Daniela was thorough with her check-in procedure and showed us a few "go-to" places on the map for us to consider during our stay. The space itself was clean and roomy enough for two people. The addition of the outdoor space made it even roomier. My husband and I both enjoyed sitting outside to read and drink our coffee. The tile on the walls surrounding the courtyard were so beautiful that I took several pictures to get the most perfect one. The area was very central. As noted by other reviewers, there is a grocery store nearby that more than meets the needs of the average traveler. The Central Market was in the other direction and was a treat to walk through. The Duomo, the Uffizi, the Academia - even our cooking class, were all within easy walking distance of the space. In short, it's a great location. The only very minor drawback is the fact that you do have to walk through the owner's personal living space to get to the cottage - something that we didn't fully recognize when researching places to stay in Florence and which took us a bit by surprise when we got there. It was not a problem (especially since the family was gone most of the time when we were in and out) but it is something to definitely consider if that is a situation that might make you feel awkward. Again though, I want to be clear and say that it was not a problem for us. Thank you Dani, Nero and all for offering such nice accommodations in Florence and for your hospitality. I'm glad you appreciated our cozy, hospitable, close-to-everything cottage! Getting through our house to access the courtyard and the cottage - which is featured in the website's description - has never been a problem for us in six years: we are quite used to it, especially because our private rooms are somewhere else, and we enjoy the quick touch with our guests, as u can read from all the hereunder reviews. I think this proximity - which doesn't affect at all our guests independence, and the fact that they can go in and out at their own pleasure and will with their own keys - is really what makes our cottage so special, secured and appreciated. Thanks for visiting us, and hope to have you back! We stayed 3 nights and overall, it was a great stay. It’s a perfect location, very quiet and we had some of the best sleep there. The reason that I’m giving it 3 stars is because of the way I was treated during checkout. As the host was doing the final walkthrough, she asked “what did you do to the TV?” She turned the TV on and it showed that “no programming” on the screen. I informed her that we never watched the TV during our stay, we never turned it on. She told me flat to my face that she didn’t believe me, basically calling me a liar and that the TV was broken. First off, the TV turned on just fine. It looked like a programming issue, most likely due to the connection like WiFi, a loose HDMI cord or being on the wrong setting/input source. I continued to stress that not even once did we ever turn on the TV but she refused to believe me. I stood there as she yelled at me, getting more passionate about how the TV was broken. The whole experience ruined the morning for me. I’ve never been treated in such a way by a host before. I will say that the host was extremely kind during our stay until the morning of checkout. I’d like to give her the benefit of the doubt, thinking that maybe it was just a moment of frustration with the technology or previous guests who haven’t respected the place and broken things. I would have never imagine to be yelled at for a TV that we never touched! When we checked in a little after 1pm, the nanny let us in but no one showed us how to turn the TV on so there’s no way to know if it even worked before we arrived. Overall, this was a nice place to stay but I would highly recommend to check everything when arriving to ensure it works properly so you’re not responsible for something that you didn’t do. Let me be clear: I never accused you of anything, never said YOU broke anything. In fact, I immediately and unquestionably gave your deposit back to you. And I apologised for losing my usual temper, and I escorted you to the door bringing your suitcases. These are the facts. You gave me my worst ever reveiw in 7 years of activity, because I regretted - probably with too much passion - that in one year I lost two DVD players and 1 TVSAT decoder (yes, yours it was broken, that is why the TV didn't turn on). Did writing make you feel better? I hope so, at least there was a purpose. I just wish people take care of things, as much as I take care of my guests. Private. Very clean. Great location. Cottage within walking distance to city center and all attractions. Proprietor very helpful with getting around. Parking a bit difficult - street restricted to resident parking only. Nice little kitchen making it easy to cook at home some of the wonderful items from Mercado Centrale. Highly recommend this location. Secure seperate flat within walking distance to all major sites and train station. Daniela was very helpful and provided everything we needed for a fabulous visit to Florence. I would recommend this place. - This cozy and new apartment is located downtown Florence, in the very heart of town, 5 min away from San Lorenzo (The Medici Chapels), Piazza San Marco (Academy Gallery with the David by Michelangelo), the Duomo area, in a quiet street with garages. - In this same street, anciently called 'via Mozza', Michelangelo had its own workshop. When he died in Rome, in this studio where found the 4 Prigioni (today at the Academia), the Madonna col bambino (at the Medici Chapels), and the famous La Vittoria, today in Palazzo Vecchio (the Old Palace). - The San Lorenzo market (handcrafts, gifts) is less than 5 minute walk. Newspapers, pharmacy, banks, coffee shops, restaurants, pubs, churches, and all kind of shopping facilities are all around. - The apartment is at 1 km distance from the S.Maria Novella rail and bus station, so it is very easy to make daily excursions to the main sites of Tuscany, including San Gimignano, Lucca, Siena. - The flat is also 5 minutes away from the park and Congress Hall of La Fortezza, the most famous exhibitions’ centre of the city (and also excellent site for jogging! ).